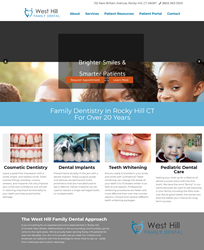 West Hill Family Dental, located at 132 New Britain Avenue in Rocky Hill, CT 06067, is a well-established family dental practice that has served the Rocky Hill community for over 20 years. Dr. Robert Hemphill leads the practice as a caring dentist who is skilled in multiple facets of dentistry. Beyond offering services in general, cosmetic and restorative dentistry for all ages, the office also provides oral surgery and endodontics. Dr. Hemphill believes in providing a comfortable experience for each patient while educating them on the importance of preventative dental care. To this end, the practice mission is to provide the tools and resources it takes to keep patients away from the dental chair as much as possible. “We are honored to be featured as a Find Local Doctors Top Patient-Rated Dentist. We treat patients like members of our own family, and we will continue to seek their approval and satisfaction at every step,” says Dr. Hemphill of West Hill Family Dental. Dr. Robert Hemphill received his Bachelor of Arts from Albion College in 1997. He furthered his education by earning a master’s degree in Health Administration at Grand Valley State University. Dr. Hemphill went on to complete his Doctorate of Dental Medicine at Nova Southeastern University followed by a general practice residency at Yale New Haven Hospital. He believes in providing state-of-the-art dental care while focusing on patient comfort and convenience. For more information about the services offered at West Hill Family Dental, please visit https://www.westhillfamilydental.com or call (860)563-3303.